On Thursday, August 30th, 2018 at 6.30 pm in Credo Bonum Gallery will be presented the exhibition “New Works” by Sirma Sarafova-Orahovac, a joint project between Credo Bonum Gallery and Sariev Contemporary, Plovdiv. The exhibition could be viewed daily from 11 am to 7 pm in the gallery space on 2 Slavyanska St. in Sofia. Join us for a guided tour with the author Sirma Sarafova-Orahovac on 15 September, 5 pm, at Credo Bonum Gallery. Every new exhibition of Sirma Sarafova-Orahovac (b. 1937) is a revelation. Her artistic work and career spans over more than 60 years and yet her appearances on the Bulgarian art scene are always sparse and careful; her works – the result of a long and exhaustive creative process. Reality, the visible and even mundane world of her surroundings, is at the core of her art. During the last more than 10 years, the artist has been collecting strange and interesting objects, masks, dolls, plates, artificial flowers and whatnot. She’s been looking for them everywhere she went – in Sofia or in America. She would order them online. Her objects are triggering complex visual and semantic links that are decoded by the power of her innate intuition. 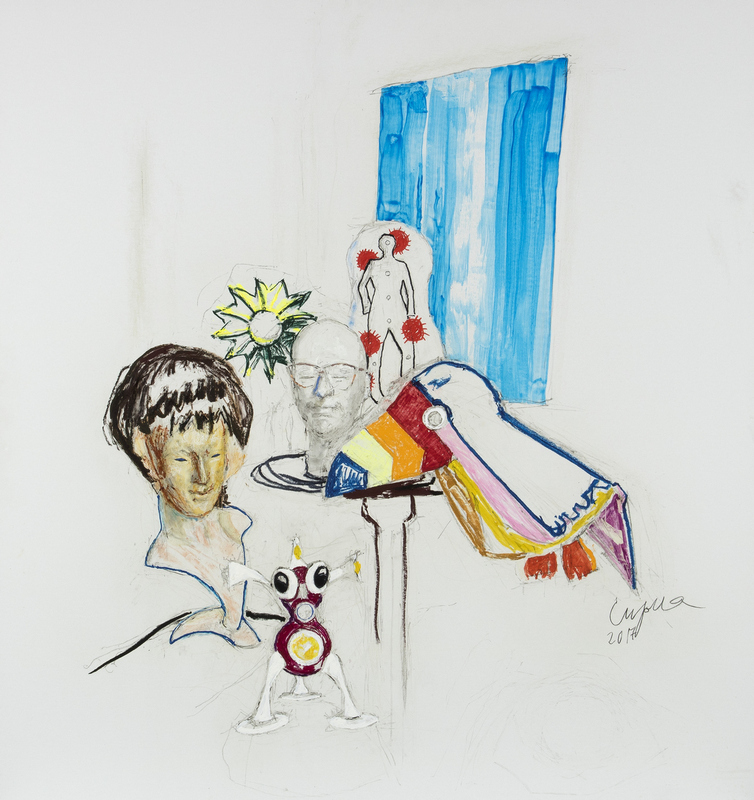 These objects become characters in her (staged) compositions, which are later on painted on show-white background with acrylic, oil or fluorescent paint. Thus the contours of a Master Yoda doll, or of an African mask and the head of a mannequin appear on the white painting surface. All elements from these ‘pop- like’ compositions carry a hidden meaning which is special to the artist. They also open up a space for interpretation and viewers’ inner reactions. The way she is interpreting her arrangements and compositions of objects is akin to the logic and the aesthetics of pop-art; the constant interplay of meanings between the various objects makes her art somehow parallel to the approaches of the American photographer Cindy Sherman. Sirma Sarafova-Orahovac is showing 8 new works in the Credo Bonum Gallery exhibition. She has also arranged an actual composition of real objects. That is how she is relating to the viewer the process of how she is making her paintings while also offering a new angle for how to read the works. Here the choice of objects and their locations is each time awarding new meaning and value to the “players” in an act. A short documentary about the working method of the artist, made by Vessela Nozharova and Kalin Serapionov, will be showcased within the show. Sirma Sarafova-Orahovac was born on 28 March 1937 in Sofia, the granddaughter of the famous Bulgarian actor Krustyo Sarafov. Assen Belkovsky, the lyrical impressionist painter, was her most important teacher. She took lessons from him while studying at the High School for Art and the National Art Academy in Sofia. She graduated the latter with honors in 1963 in the painting class of Prof. Boris Mitov and Prof. Iliya Petrov. Soon enough, it became obvious that her sense of artistic autonomy is incompatible with the official artistic life’s rules in Bulgaria at the time. Her works remained unknown to the audience while being appreciated by a close circle of friends and occasional connoisseurs of art. Her art evolved through several stages. In the 1960-70s she made portraits, landscapes and still-life characterized by airy lightness and lightly delivered sparse color areas. After an invitation by Olympia Nikolova in 2006, she exhibited at the Sofia Press Gallery. Her works were compared to the style of the Far Eastern water color painting and the laconic expression typical for haiku. After this show, her work evolved into more decorative expression while the collection and use of various objects transformed its appearance completely. In 2016 Vesselina and Katrin Sariev showed her exhibition „Objects and Illusions” at the Sariev Contemporary Gallery in Plovdiv. The show, curated by Maria Vassileva, showcased Sirma Sarafova-Orahovac' early works as well as her newest compositions, never before seen by the public. The show enjoyed huge interest from the public but mostly from the younger generation of artists. That posed once again the question about the vitality and importance of her art and talent. At the age of 81 Sirma Sarafova-Orahovac is hard at work experimenting as always. Watch a film on occasion of the exhibition "New Works"